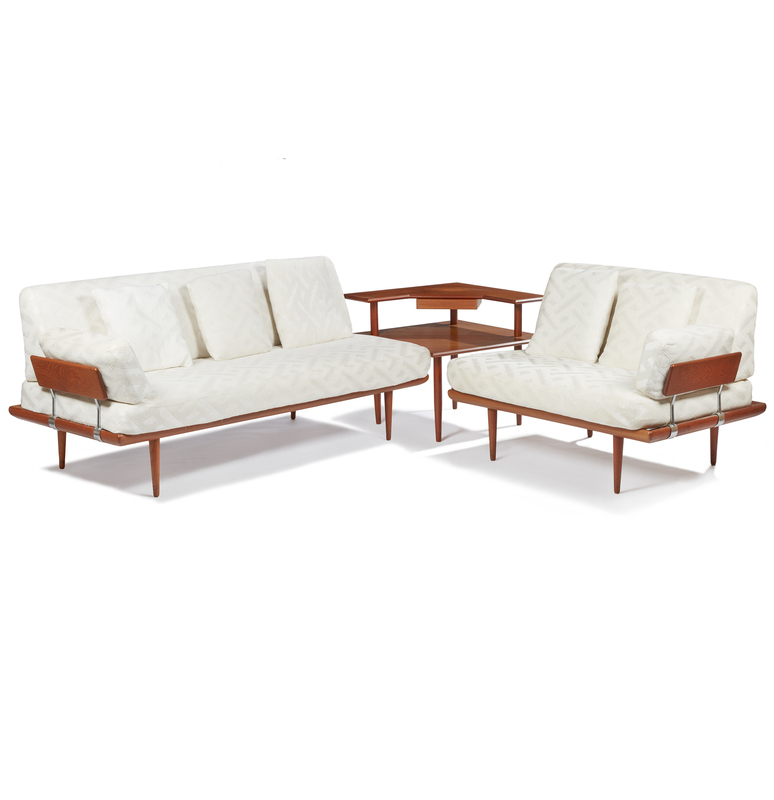 A mid-century modern sectional set comprising three pieces including one love seat, one larger couch, and a central square side table. The couches have a wood frame, steel hardware accents, and white matelassé cushions and pillows (five total). Dimensions: approximately 32 1/2"h x 50"l x 32"w (love seat); 32 1/2"h x 77"l x 32"w (larger couch); 25 3/4"h x 30"l x 30"w (table). For delivery quote, please contact Box Brothers Sacramento at boxbrosacto@gmail.com. Minor wear to be expected with age, but overall in very good to excellent condition. No apparent discoloration or major stains on the upholstery (some very minor spots in a few places) and no signifiant damage to couch frames or the table. Witherell's strives to provide as much information and photographs as possible but encourages in-person inspection by bidders. Condition statements are only for general guidance and should not be relied upon as complete statements of fact and do not constitute a representation, warranty or assumption of liability by Witherell's. All lots are sold "AS IS" under terms and conditions. Please be advised we do not furnish packing materials nor porters for pick ups.